George Waterhouse was born on 6 March 1810 in Somers Town, North London. His father was a solicitor’s clerk and an amateur lepidopterist. George was educated from 1821-24 at Koekelberg near Brussels. On his return he worked for a time as an apprentice to an architect, but his self-taught knowledge in natural history won out. Waterhouse was particularly interested in insects and mammals. He was one of the founders of the Entomological Society of London in 1833, and was president from 1849-50. After a brief appointment as a curator at the Royal Institution at Liverpool in 1835, he returned to London the following year to become the first curator at the museum of the Zoological Society of London, earning £120 per year. In 1838, Waterhouse published his Catalogue of the Mammalia, listing 665 mammals. Like Darwin he was fascinated by beetles (Coleoptera), publishing many papers on the subject. When HMS Beagle returned in 1836, Waterhouse was sent small mammals and insects from the voyage to describe. He recognised 19 new species of South American mice and one new genus. Waterhouse contributed the volume Mammalia to Darwin's five-part Zoology of the Voyage of HMS Beagle in 1839, and described most of the beetles in a series of articles. Darwin and Waterhouse exchanged several letters, often discussing issues of the classification of species. Importantly, Darwin suggests to Waterhouse the idea of ‘grouping beings’ according to their ‘descent from common stock’ in a letter of 1843. In the same year, Darwin wrote a testimonial for Waterhouse to support his application for a post in the natural history department of the British Museum, following his discharge from the Zoological Society on grounds of economy. Darwin subsequently congratulated him on his appointment as assistant in the mineralogical branch. 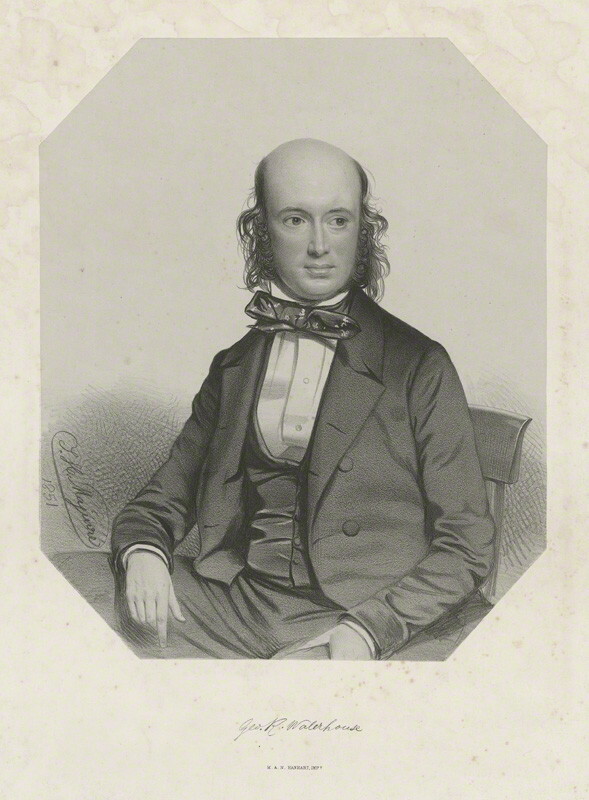 Waterhouse became keeper of mineralogy in 1851 and keeper of geology in 1856, where he added substantially to their fossil collection. He remained at the British Museum until his retirement in 1880, but his early skills in architecture were called on to inform the design of the new Natural History Museum in South Kensington, which opened in 1881. Waterhouse had six children following his marriage to Elizabeth Ann Griesbach in 1834. His son, Charles Owen Waterhouse (whose godfathers were Charles Darwin and Robert Owen), became an assistant keeper in the zoology department of the British Museum. Waterhouse suffered a stroke in 1885 from which he never fully recovered. He died at home on 21 January 1888. Thanks GRW for collection [of insects] he has made up for CD’s nephew. Leaves decision to GRW as to which institutions should receive CD’sBeagleinsects. Classification consists of grouping beings according to descent from common stocks. Analogies are resemblances between forms not inherited from common stocks. Neither number of species nor grade of organisation should be considered in classification. Admits that caution is necessary in admitting a few species to form a group of rank equal to one containing many species. Discusses classification of animals. Degree of affinity different for different taxonomic groups. Discusses affinity ofOrnithorhynchusorEchidnato reptiles. Brain of whale is highly developed; on differences among brains of Quadrumana. Congratulates GRW on appointment to position at British Museum.